How the sport of running is for everyone – How to Run Happy? Unlike most other sports, all you need for running is a pair of running shoes and a positive attitude. Anybody can Run and it does not take hand eye coordination or huge muscles like a lot of the sports on TV we watch. It does not matter how old, what gender, what athletic ability but anybody who is willing is capable. You can be the smallest kid on the block or biggest kid. The weakest kid or the strongest kid. The skinniest kid or the bulkiest kid. The slowest kid or the fastest kid. The un athletic kid or the most athletic kid. The point is it does not matter who you are, who you were or who you will be. Anybody can do it, if they are willing to. Quora. See running is the bases for a lot of sports and when you just run, you don’t have to worry about adding other components to it. All you do is just run. You honestly don’t even have to think, you just have to do. People that play other sports dread what we love about our sport. This is a truly an amazing thing. Athletes in other sports are punished by the thing we love the most. People Run for a multitude of reasons, but the common thing we all have is that we all decided to do it. Stop thinking that running is not for you and start thinking that running is for you. 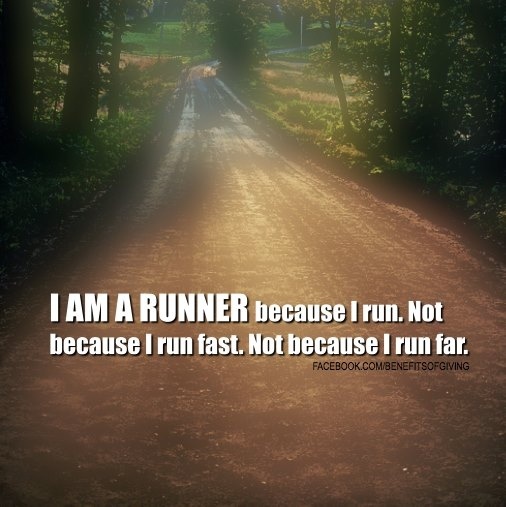 Stop thinking you run only for exercise and start to run because you are Passionate about it. To conclude, I think from my own personal experience of seeing it, that anybody can run. It does not take a special ability or talent. Just a willingness to try it. So finally say to yourself I am going to do this. Get up and Just Run! And always Run Happy! Stay tuned for my next blog, “With the proper running shoe, what is the key to running happy?”. So you can finally get to the bottom of this whole “Running Happy” thing.